Spiders are arthropods that have eight legs. They have more legs and different body parts than insects, and they also don’t move around in the same way insects do. Spiders are in the arachnid class, but not all arachnids are spiders. There are about 40,000 known species of spiders. Most spiders use a web to catch their prey, which is usually insects. The largest spider is the Goliath tarantula, and they can catch birds. The smallest spider in the world is less than 1mm long! Spiders are arthropods, like insects – they have an exoskeleton that is on the outside of their body instead of the inside (unlike humans). There are around 40,000 known species of spiders. There are a few main differences between spiders and insects, and one of these is the number of legs – all spiders have eight legs. Spider bodies are made up of two main parts – the cephalothorax and the abdomen. Spiders create silk from spinneret glands in their abdomen. Spider silk is extremely strong, and has a number of different uses. One of the ways spiders use silk is to create webs, which catch prey. 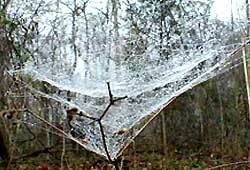 There are a few different kinds of spider webs, such as orbs, funnels and sheets. Not all spiders catch their prey in webs – some hide and wait for insects to come by. Spiders lay eggs, and store them in an egg sac to keep them safe. In the UK, there has never been a recorded death from a spider bite. It takes a spider about an hour to build a web, and they usually build a new one every day. Not all spiders catch their food in webs. For instance, the wolf spider makes a hole in the ground, and waits inside for prey to come near before catching them. The largest spiders are tarantulas, and the largest tarantula is the Goliath tarantula. The smallest spider in the world is the Patu marplesi, and it was found in Samoa (in the South Pacific Ocean). Even though spiders have eight eyes, most of them can’t see very well – they rely on what they feel in order to know when they’ve caught prey in their webs. The average human adult is over a 250,000 times heavier than a spider by weight! Most spiders that build webs are called orb-weaver spiders – this is because the web is a round spiral. Not all webs are made in the spiral shape that we see most often. 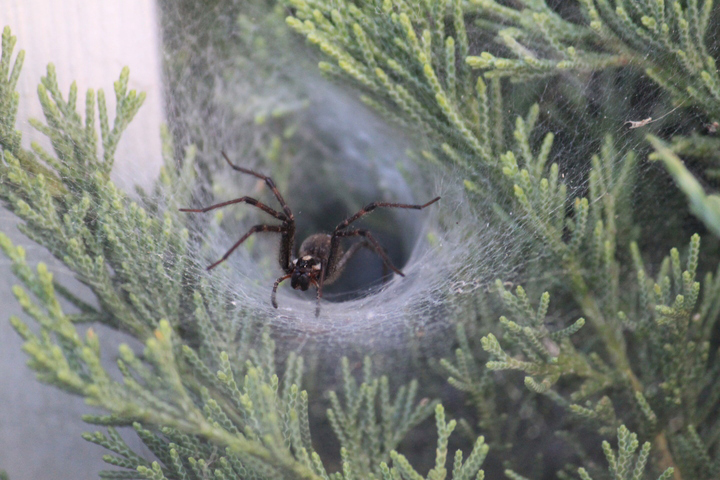 Some spiders build webs in tube shapes, funnel shapes, or in dense sheets. There are around 40,000 species of spiders, and all but one of those species is carnivorous – this means that they eat other living insects and animals in order to survive. Spiders are athropods, and they have exoskeletons. Their bodies are made up of two main parts – a cephalothorax and an abdomen. Most spiders have four pairs of eyes on their cephalothorax. Whichever kind of web spiders make, they do so by producing silk. This comes from spinneret glands on their abdomen, and each gland produces a different kind of silk – some sticky, some fine, and some for building different parts of a web. Spider silk is very strong – it needs to be, in order to trap prey and keep baby spiders safe. Tarantulas can also produce silk from their feet. When a spider lays eggs, she stores them in a sac that she makes from a kind of silk. She then attaches this to a web or in a nest to keep it safe, or carries it around with her. Wolf spiders carry their egg sacs, and when they hatch the spiderlings (baby spiders) sit on their mum’s back. Some young spiders and smaller spiders will use their silk to help them travel around by floating in the air – this is called ballooning. They shoot off some silk that catches in the wind, helping them drift to a new home. Spiders catch prey by either jumping up and attacking it, or by making a web with sticky silk – insects, and sometimes birds get caught in the webs and can’t get out again. Most spiders have poor eyesight, but they can sense that something’s caught in their web by feeling it move. They trap their prey in a cocoon of silk, and then inject poison into it. Spiders don’t try to go after humans, but they may bit someone if they are trying to defend themselves. While spider bites are poisonous, some of them affect humans about as much as getting bitten by a mosquito or a stung by a bee. We like spiders because they catch insects that can hurt us, such as wasps. Being afraid of spiders is called arachnophobia (a ‘phobia’ is a fear). It’s the most common fear that people have, but spiders shouldn’t be so scary. In the UK, nobody has ever died because they were bitten by a spider. If you were a spider, which one would you be? Find out with a CBBC quiz! How quickly can you put together a spider jigsaw puzzle? Use your spider skills to catch prey in your webs! 'Build' a spider web online. Create your own spider by picking a head, body and legs. A kids' guide to spider types from DKfindout! Discover how spiders help us! Look through a checklist of British spiders to help you identify any you see!